Join the discussion on our forums! 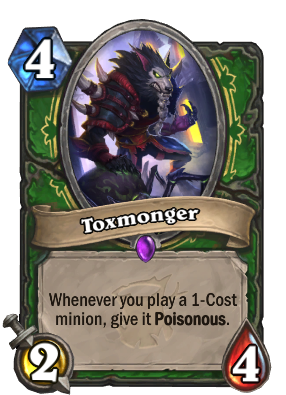 Come discuss Toxmonger over in our dedicated Toxmonger discussion topic. Yes, as the text reads, "Play". Bombs are indeed summoned so they do not gain poisonous. Good thing it says "play" not "summon" or it'd be broken with Unleash the Hounds. I was thinking Fiery Bat but yes, that's even better! Only issue is you also clear your own board. However, if you play it on Turn 5 after Toxmonger it's likely that you don't have a board to begin with. That would have been just terrible! Playing Hearthstone would have become terrible. Cool concept and would work fantastically in quest hunter... but it's stats are so underwhelming it just hurts the card too much. this is a straight up quest hunter card it wont see any use in anything else due to the fact it has the "whenever you play" tag instead of whenever you summon. the question is will this work with cards like elven archer making the battle cry deal the poisonous effect? In wild this card will make the N'zoth tentacle extremely powerful. Any 1 mana echo card would be too busted. it basically doubles the times you can cast it if it was 1 mana instead of 2. Stonetusk Boar can already do this if you run Hunter's Mark. The pros of this card are that you can do it multiple times if you are running multiple 1 drops, and have a 2/4 body on board that needs to be dealt with. Good card, will probably see play somewhere. If only Injured Blademaster and Fel Orc Soulfiend costed 1, we would have a pretty OP card on our hands. No it says "whenever you play" not summon so.. no spell summoning minions, not cheating out minions from the deck or hand, you physically have to play the card to get this poisonous effect. I believe this card was printed specifcally to be used with Echo cards and taunt cards, it's flexible in the sense it works in a midrange and control deck but it just doesn't do the job the fact it says "Whenever you play" limits options let alone it requiring 1 cost. With all that said this will be a must include in quest hunter. Ohh.. rip i get it lel but even if this interaction happens i think battlecrys trigger before the card is played?